Melly and Rick decided that his full name should be Winston Bumblebee Barcode the 1st. Now he’s all full of himself. Melly let Winston come out to the pool with me. He sat on the platform at the top of the ladder and we had quite a nice long chat, but he wouldn’t come in. 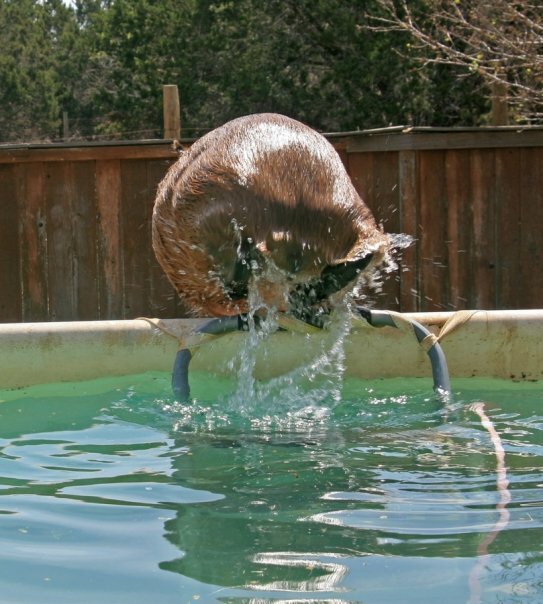 Winston said water and rodents don’t mix. 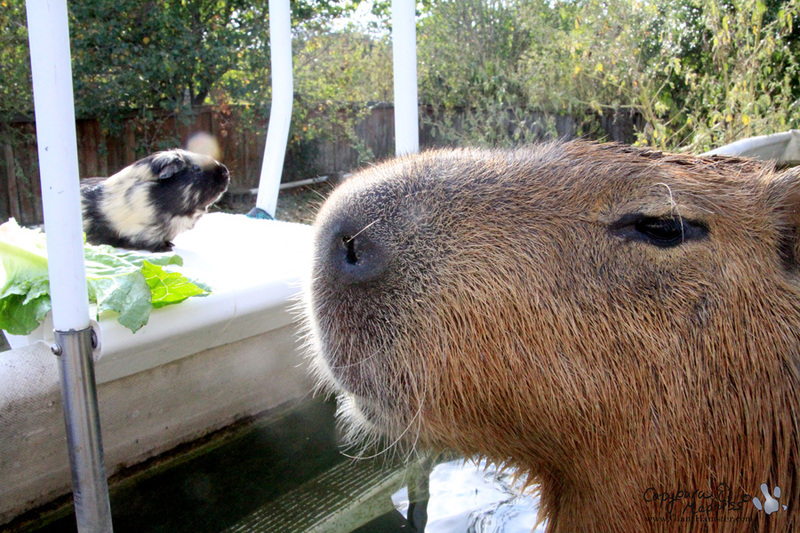 I told him that’s just silly, capybaras and beavers are the two largest rodents and we are both very aquatic. So he changed it to water and small rodents don’t mix. He’s got me there. 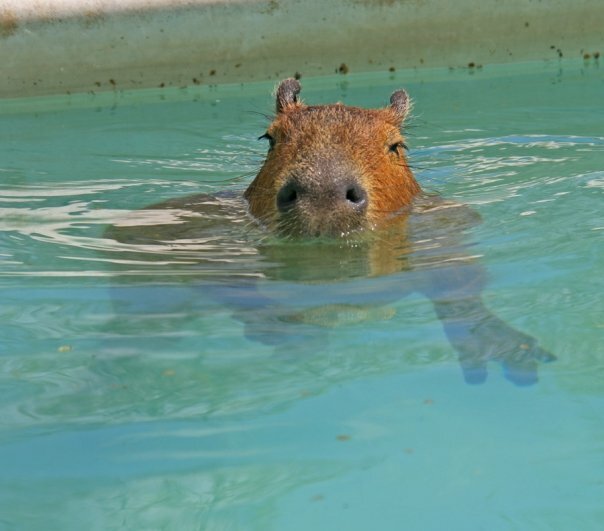 I don’t know any small rodents that really like the water. 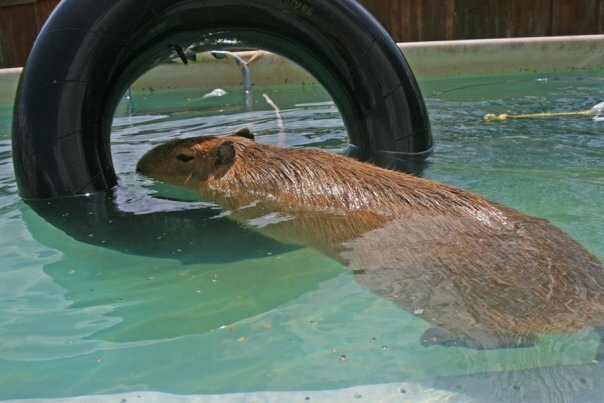 Bakersfield, my rat co-pet, can swim but I wouldn’t say he likes to. Melly gave both me and Winston some lettuce and then she tried to photograph us. Winston finished his too quickly though. (It was just a tiny piece.) I ate a whole loaf of romaine so she was able to get a better shot of me eating. Isn’t Winston cute with his lettuce? Actually, I ate that piece but you get the idea. He’s got such a tiny mouth, he could never eat a big leaf like that. 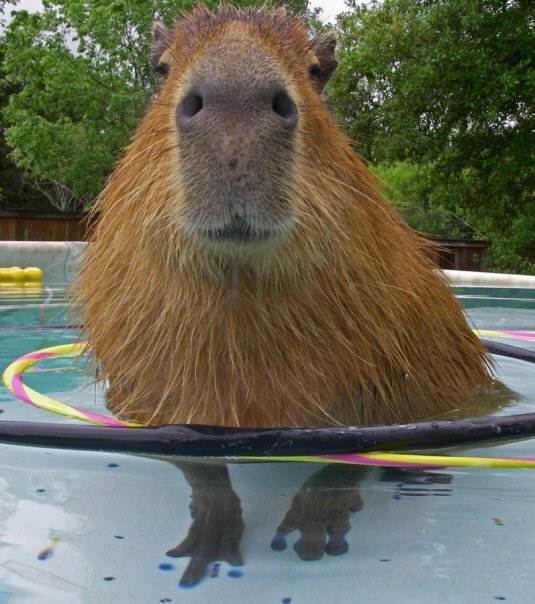 Someone had to help him and I’m just the capy for the job! 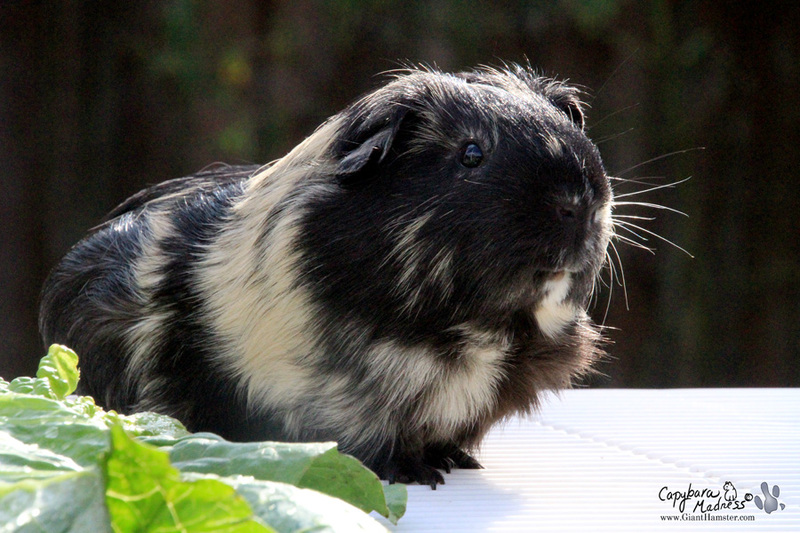 Melly thought Winston might be afraid to be outside, high on a platform over the water, but he didn’t mind at all. You can see how relaxed he is. He’s a very brave piig indeed. Winston is so brave that he lets Melly hold him upside down. Because of this, which I have heard is unusual in a guinea pig, I think I might be able to teach him to roll. He would make a great sidekick for me in Nic Lara’s comics. He could have a matching blue cape. 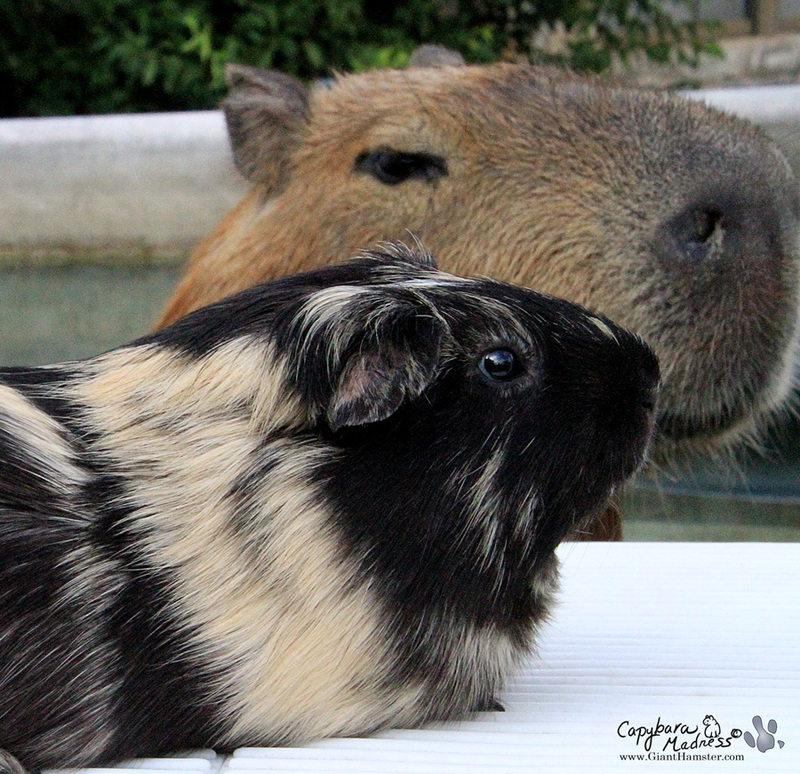 My cape says “Super Capy.” Winston’s cape could say “Super Cavy.” We are going to make a great dynamic duo! So cute! I love Winston! That is one adorable piig! 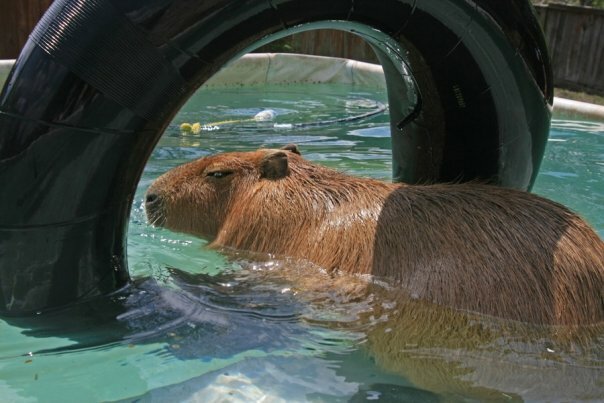 But I’ve just learned, to my very great sorrow, that guinea pigs can get GDVs. So it might be a good idea *not* to roll him, just in case. Aw! Hi Winston! You and Gari will make the ultimate super rodent duo! For truth, justice, and the rodent way! 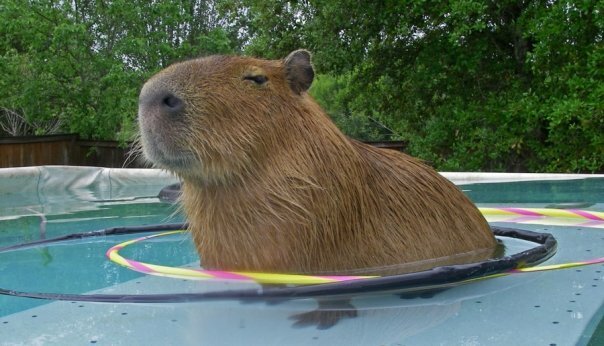 I think that putting Winston in the capy comics is a great idea. I also have Bakersfield as hawkeye in part 3 but that’s all I can give you as a sneak peak for later. Great photos! Great name! And thanks for the sneak peak Nic! 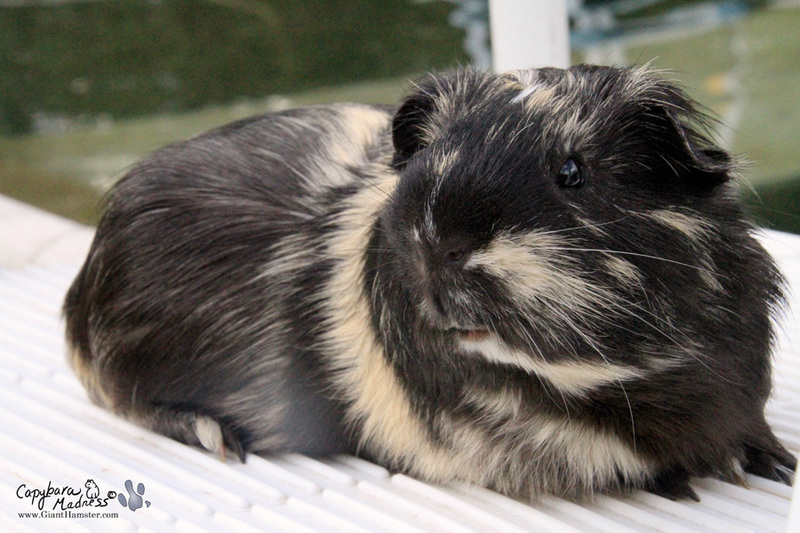 Winston, what a super cute piig!! And Melly is a great photographer of his cuteness!! I knew Gari & Winston would be besties!! Sooo cute! Your Winston is SO cute! Please no rolling for Winston — GPs are not built for rolling or running in wheels. They are good for snuggling; their bellies and bums always have to be supported. 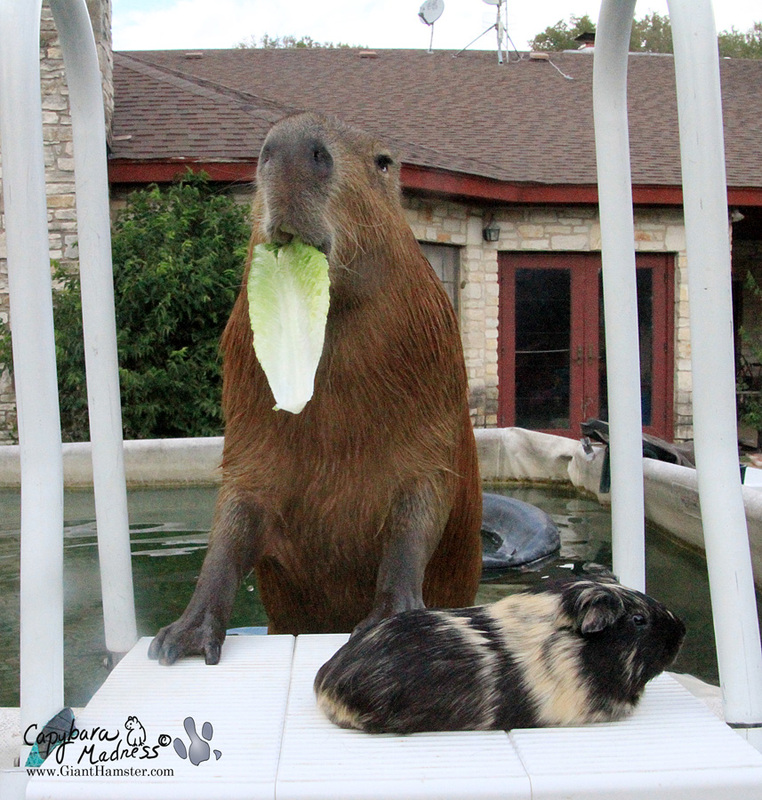 They are luv running, hiding, excellent at eating lettuce. Hi Winston. What a noble name. You want to be careful leaving Winston outside. Guinea pigs are easy pickings birds of prey. I hope you and your new buddy have a lot of great adventures to share with us. Oh my, Winston’s full name is bigger than he is! He’s a very unusual color & I’m glad we will be seeing him regularly. And it’s great that Gari & he get along so well. He is SUCH a handsome pig. And so relaxed! 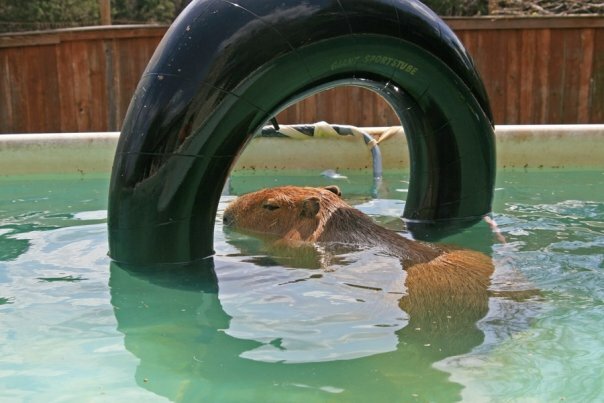 Most guinea pigs would be freaking out, but he’s just chillin’, like a pig loaf. Beautiful coat Winston! Gari is so nice to others! How many guinea pig friends do you have now gari? Maybe you can show us a photo with all of them in it! and their names of course! Gari — next time Winston says that small rodents and water don’t mix remind him of muskrats. 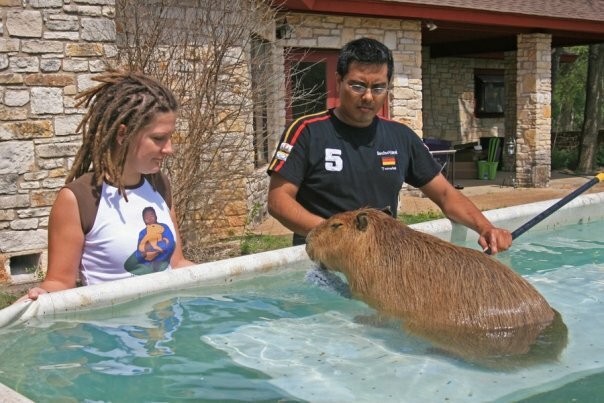 They aren’t any bigger than guinea pigs and very aquatic. Melly, Winston is so adorable! They do make a cute pair! 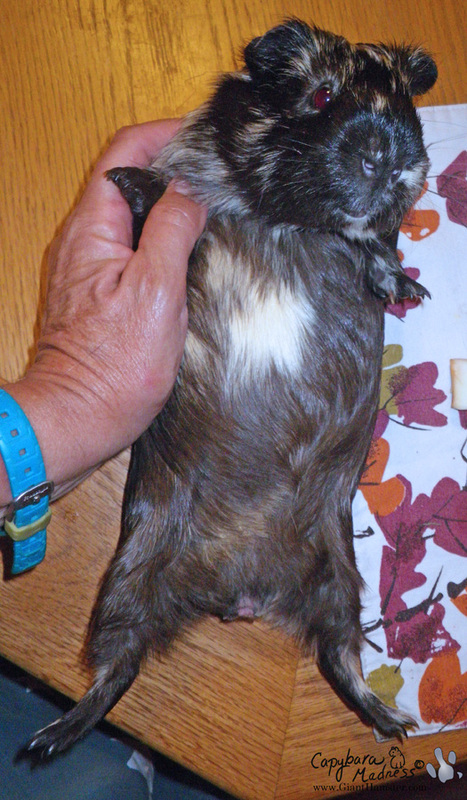 WBB1 came from a local pet store where he was promoted as “Free adult guinea pig with cage.” I suppose he might have been someone’s unwanted pet or maybe a breeder who outlived his usefulness. He is, however, an amazing pig. I am about to write a blog post about him.